Pure artistic talent is hard to limit to just one medium: Tony Bennett also built a respectable career in watercolor, and Keanu Reeves plays a mean bass in addition to being considered by many as the finest actor of his generation named Keanu Reeves. 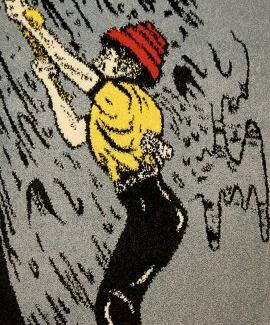 Channeling his creative genius into awesomely cartoonish rugs, Devo's Mark Mothersbaugh. Since he hit the big time Whipping It, Mothersbaugh's been writing scores for successful TV and film projects like Rugrats, Pee-Wee's Playhouse, and a handful of Wes Anderson flicks, and recently channeled his inherent talents into designing a prolific for-sale collection of Devo-bizarre rugs, because you know what they say: when life gives you cultish fame, you make weird home goods. Available now in limited quantities, each doormat-sized nylon rug features different colorful scenes designed by legally blind Mothersbaugh, including a series of creature-inspired pieces like "Jihad Detecto", depicting a pompadour-ed pug holding a dial/remote beaming a signal into the air, "Robot Loses His Head" in which an ogre-ish dude rips off a robot's boxy cranium, and "The Sleepover", boasting a man asleep in bed next to a green cyclops, in case your dates need any extra reason not to cross your threshold. Many of the rugs're also available in a larger, requestable-by-email 4' x 6' versions, including a maddened bespectacled scientist surrounded by whirling red/yellow streaks entitled "X-Ray Visionaire", the "Devo Rope", featuring an anonymous Devo member being hoisted from what looks like a puddle of dark liquid, and a Devo-hatted man falling through a hole titled "When He Fell Through The Trap Door, Then Everything Started Going Wrong", which is either a representation of the uncertainty that will befall him when the band eventually breaks up, or just a really sweet trapdoor rug. There's also a more complete collection of previous Mothersbaugh rug work available for sale via email on a separate website, including a few Rorschach-like pieces, to which Keanu always responds with what many consider the finest "whoah" of his generation.